But there was one thing he couldn’t do: change the elevation of the sun. 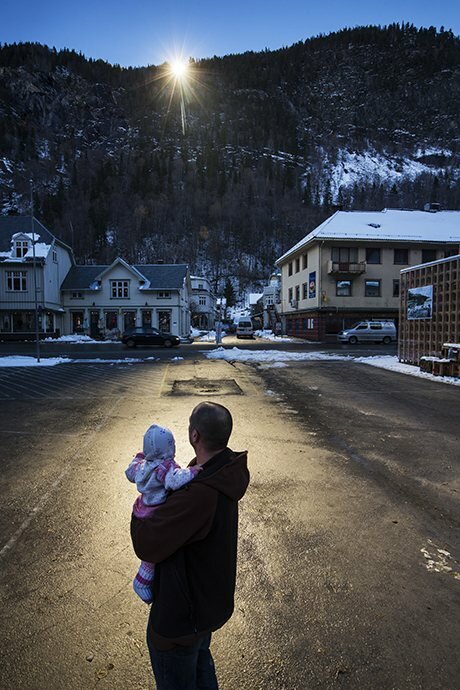 Deep in its east-west valley, surrounded by high mountains, Rjukan and its 3,400 inhabitants are in shadow for half the year. During the day, from late September to mid-March, the town, three hours north-west of Oslo, is not dark (well, it is almost, in December and January, but then so is most of Norway), but it’s certainly not bright either. A bit … flat. A bit subdued, a bit muted, a bit mono. Sunlight reflects off the three giant mirrors. Photograph: David Levene for the GuardianA hundred years ago, Eyde had already grasped the gravity of the problem. 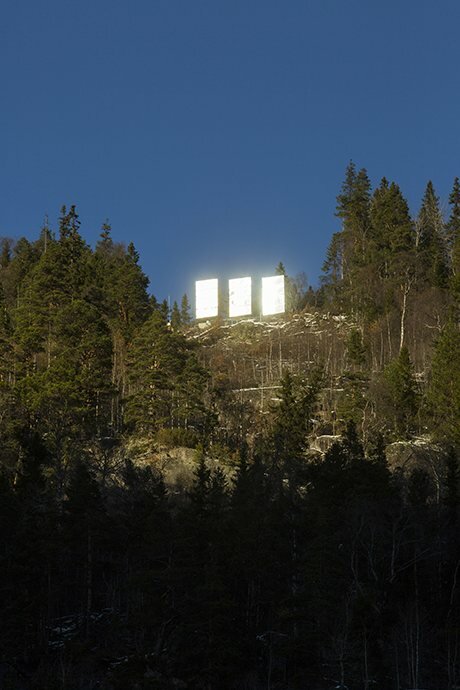 Researching his own plan, Andersen discovered that, as early as 1913, Eyde was considering a suggestion by one of his factory workers for a system of mountain-top mirrors to redirect sunlight into the valley below. A man holds his baby up to the light reflected by the mirrors. Photograph: David Levene for the Guardian”I was strongly against it,” admits Nils Eggerud, a Norsk Hydro employee for 50 years and now retired. Like many others, he felt the money could have been better spent elsewhere – on a couple of extra carers to look after Rjukan’s old people, perhaps, or improved school facilities, cycle paths, a bit of rural road resurfacing. 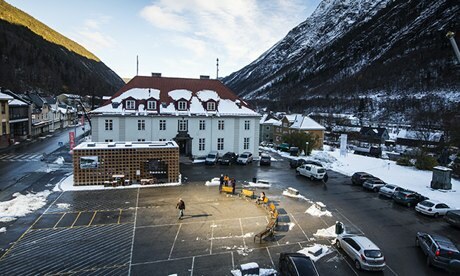 In his office overlooking the square, Rjukan’s energetic young mayor, Steinar Bergsland, is interested not so much in the cost but in the benefits the mirror might bring to the town. Thanks to sound planning and government investment, Rjukan has survived the loss of much of its original heavy industry relatively unscathed. But the small town could do with the money. Already, Bergsland says, visitor numbers are up for the time of year and last weekend Rjukan’s shopkeepers reported their takings following suit. Only this morning, the mayor took a call from a hi-tech company interested in relocating to Rjukkan, attracted by the cutting-edge technology on view at the top of the mountain and the publicity it has attracted. Few on the streets seem to dissent (although Tarjei Steffensen Stortland, a 16-year-old student, still reckons the roads round where he lives could do with some attention). And Rjukan, best known for the wartime heroics of 12 SOE-trained Norwegian commandos who in 1943 destroyed a Nazi-occupied Norsk Hydro heavy water plant at nearby Vermok, thwarting Hitler’s atomic bomb ambitions, undeniably has a new claim to fame. But no longer. Now there’s the Solspeil. “A work of art,” Larsen says, “with a real, vital function, fulfilling a basic need in people’s lives.” Down on the square, Ingunn Sparbo might not put it in quite those terms, but she can’t agree more.